Other Products by Scivation. Search other Amino Acids products. Scivation Xtend Go provides everything you know, love and expect from Xtend with the addition of the “Xtend Go Nucleus”………..for razor-sharp focus and useable energy to mount all out warfare in your next training session. 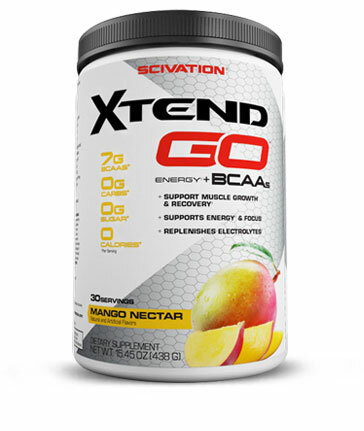 Scivation Xtend Go provides the BCAA’s in the nature identical 2:1:1 ratio critical to protein synthesis. Also providing 2500mg of the anti-catabolic nutrient Glutamine, Xtend Go is an imperative step towards muscle growth and recovery. Designed for intra-workout use Scivation Xtend Go delivers a synergistic blend of Caffeine, L-Threanine and the mood-enhancing herb Sceletium tortuosum, for a hard, constructive training session without any crash. Scivation Xtend Go contains zero calories and is carbohydrate and sugar free. So go forth in pursuit of your ideal workout with Xtend GO! Mix 1 scoop (14.6g) per 235 - 295ml of cold water. Shake and consume intra-workout (during exercise) on training days. Also use in the morning or any time an extra boost is needed. Do not exceed 3 scoops per day. OTHER INGREDIENTS: Citric Acid, Malic Acid, Natural and Artificial Flavours, Sucralose, Gum Arabic, Acesulfame Potassium, FD&C Red #40 Lake, FD&C Yellow #5. ALLERGEN WARNING: Produced on equipment that also processes dairy, wheat, peanuts, eggs, fish, shellfish, almonds or other tree nuts, sulfites or corn. Contains Soy.